This volume opens by providing a comprehensive overview of the use and regulation of metals in our society, metal properties, and available testing methodologies. Common and uncommon metal allergens and sources of exposure are then reviewed in depth, detailing allergic responses and paying special consideration to select patient populations. In the general population, the prevalence of metal allergy is high. Environmental sources of metal exposure include jewelry, clothing, electronic devices, coins, leather, diet, and occupational exposure. Metal allergy may result in allergic contact dermatitis and systemic contact dermatitis, as well as several less common manifestations. 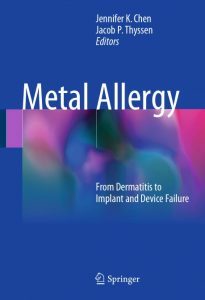 Further, metal allergy has been associated with device failure and/or dermatitis following implantation of medical devices and dental implants. As metals are ubiquitous, this book will be indispensable for a wide range of clinicians and investigators. This handy reference will meet the needs of all health professionals and investigators who are interested in metal allergy and its diagnosis and management.